For being mostly Italian, and for having a last name like ‘Peduzzi’, I’ve posted a shockingly tiny amount of Italian recipes on the blog. Yes, we had risotto. And I adore balsamic vinegar so very much. But, after blogging for nearly an entire year, is this all I have to show for myself by way of Italian grub?! My eyes lit up; it has been forever since I had an Italiano feast! Going to an Italian restaurant as a gluten free vegetarian isn’t the best idea; while menus always have vegetarian pasta or pizza options, the chance of you finding a place that also has gluten free noodles and/or dough is slim to none. And it’s pretty useless to make a full-blown Italian extravaganza for only two people. Although I’m pretty sure that Mark and I, aka. the garlic king and queen, would for serious love that. ? 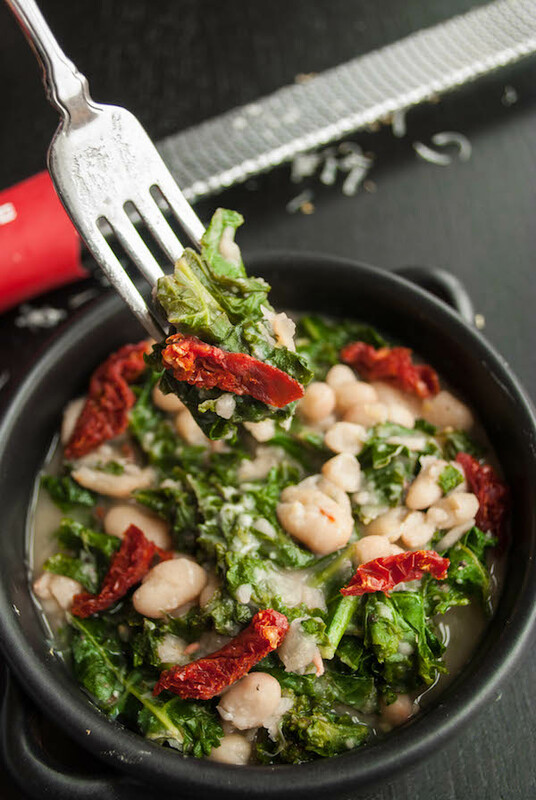 I think this easy beans and greens recipe may just need to make an appearance during our Christmas dinner celebration. It’s freakin’ simple and takes a whole 10 minutes to throw together. It’s full of fresh and flavorful Italian ingredients like garlic (❤️), red pepper flakes (❤️❤️), and sun-dried tomatoes (❤️❤️❤️). And it’s the pure definition of “healthy comfort food,” which is an absolute necessity on Christmas! C’mon, friends! Let’s dive into this delectable beany goodness! If you need fast, simple, and delicious on Christmas, I’ve got your solution right here! And it all starts out with some garlic. 3 cloves to be exact. Sure, you can totally use 2 or be crazy and use 4, but I think 3 gives this dish juuuust enough of a bite. We’ll also be using some fresh lemon zest and juice, some dried Italian seasoning, and some spicy red pepper flakes as some additional flavor enhancers in this dish. Delicioso! For the greens, I used kale because I’m a hipster foodie who’s head-over-heels in love with the stuff. But also because it can stand up to the sautéing and simmering we’ll be putting it through. For the beans, we’ll need a can of great northern white beans because they’re delicious and they get supa-dupa creamy after they’ve had a chance to break down and cook for a bit. For extra creamy dreamy goodness, we’ll add a bit of freshly-grated parmesan cheese to the mix. And to reeeeally put this dish over the top, we’ll add a whole mess of sun-dried tomatoes; they add such a wonderful pop of sweetness and that color…so dang beautiful! Mama mia! Talk about a festive Christmas dinner dish! Those reds and greens! ? Let’s add some Italian flair to our holiday festivities and cook.it.up. 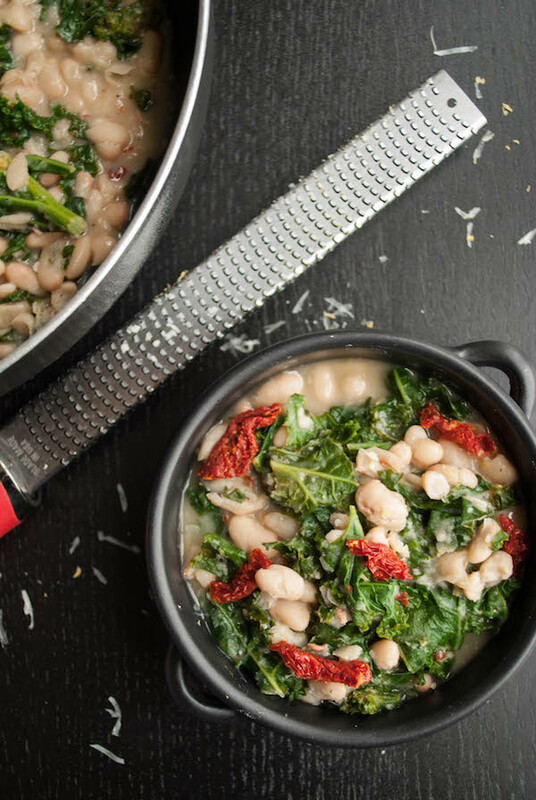 with these easy beans and greens! Add olive oil and garlic to a skillet over medium-low heat. Sauté until the garlic has softened and become fragrant, but not brown. Add kale and salt and pepper to taste, and sauté for about a minute, or until the kale just starts to soften. Add water/broth and beans, and mix until combined. Increase the heat to medium. Add Italian seasoning, red pepper flakes, and salt + pepper to taste, and mix to combine. 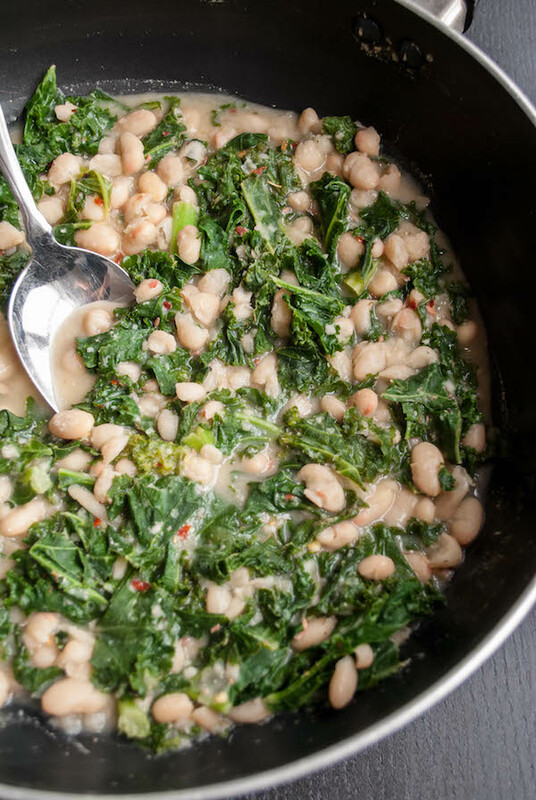 Allow the mixture to come up to a boil, then reduce to a simmer and cook until the liquid has evaporated to your liking – I like my beans and greens rather creamy, so I like more liquid in the final dish. Mash some of the beans near the end of the cooking time if desired. Once the liquid level is to your liking, remove the skillet from the heat and mix in cheese, sun-dried tomatoes, and lemon zest and juice. Serve with additional freshly cracked pepper, a drizzle of olive oil, and additional cheese if desired. Serve as a side, or add rice or quinoa for a more filling meal! This looks sooooo yum! I too grew up in a very Italian family and struggle on holidays now that I am vegan. I think I’ll be adding this into the Christmas menu this year! Thanks so much, Ashley!! That’s exactly how I feel, too. In a family of meat-eaters, what’s a girl to do?! Hope you give this a try – let me know what you think if you do! Oh my gosh, an Italian Christmas feast sounds like heaven!!! I love how comforting and tasty this dish looks :) I’d love a bowl on this cold, snowy day! Omg I make this stuff ALL THE TIME!! In my house, it’s become our last-minute-lunch-dish to throw together (when I realize at 9 pm that we ate ALL the leftovers and I’m without food for work tomorrow haha. foodie problems.). Such a great quick, flavorful veggie dish!! hahahaha foodie problems – FOR REAL. The night before, I’m always asking Mark what I can make him for lunch the next day. You’re right – this is PERFECT for those times! Alexa, this looks soooooooooo good. Like, I definitely want to eat all of that right now good. And I also love the festiveness of the red and green from the tomatoes and the kale – the perfect christmas dish!! Alexa this looks so good and healthy! You DEF need to recirculate this post for all those New Years resolution peeps. Seriously what a perfect meal for lunch or dinner! I could totally see this smothered all over a baked potato too! NUMMY!! !